You can lose thousands of dollars a year through “double payments“ and discounts lost because check arrive late. 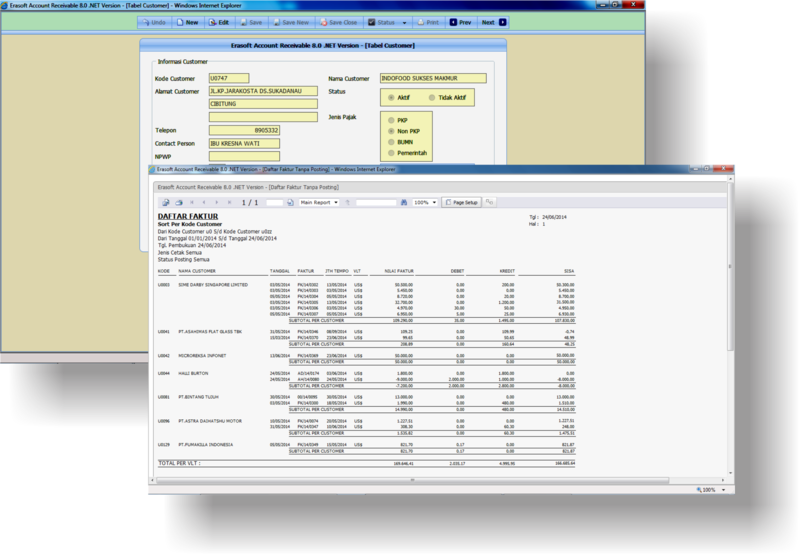 Erasoft General Ledger (GL) categories and summarizes Your Accounting Information. Erasoft Sales Order help you to Manage & Control your Order Processing, Form Order Entry, Order Validation, Order Confirmation up to Picking list Order Form. Erasoft Receiving Modules help You to Manage and Control Receiving Process. You can choose Your Receiving Process. You can choose Receiving System between “Received base on Supplier Invoice ‘or’ Received base on Warehouse / Inventory Received“. 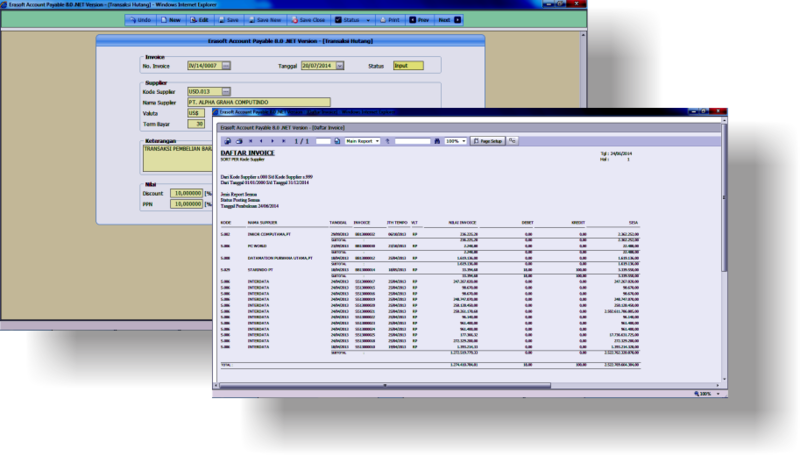 Erasoft Purchase Order Helps You to Manage and Control Purchasing cycle from Purchase Order. 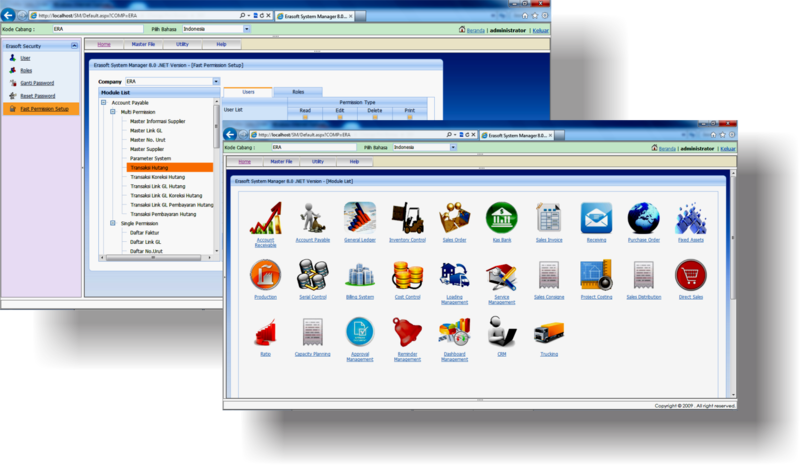 Erasoft Service Management System is a Spesial Design for Service Company such as Electronic & Computer Service Center, Air Condition Service Center, and Car Service Center (Bengkel) . Erasoft Project Costing provides a completely integrated cost management solution for all projects and activities across your enterprise, with the ability to cross currency and organizational boudaries. Erasoft Payroll is a powerfull and complete Payrol System for Indonesian version. User defined parameter & setup to make the System more flexible and east to use. Erasoft – Time Attendance System is a powerful time attendance system which can hadle simple & complex Work Schedule Setup. Erasoft Sales Invoicing helps you to Manage And Control your sales administration work, such as Delivery Order (D/O), Invoice (Business Invoice and Tax Invoice) and give you an Accurate Information of your Sales Analysis Status. One of the most difficult things to control in trading or manufacturing company is “Inventory Control”. This cause by several problems such as Number of Item, Item Type, Item Group, and Variation of Transaction. With Erasoft – Inventory System, you can handle almost all of these problems quick and easier.